Knowledge Chronicles - Is It Just Entertainment - That's Reality TV? You hear so much "Bad Press" about Reality TV as a result of the drama that is shown on Housewives and Divas franchise shows, but there are other reality shows that you may or may not classify as "Reality TV". So let's explore the genre of Reality TV. The first reality series actually begin in 1991 with the Dutch series Number 28. That's Right! The first Reality TV show was not an American show. 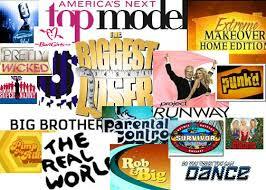 Reality Shows exploded in the 1990s and 2000s with the emergence of Survivor, Idols, and Big Brother. Surprise! The Housewives and Divas did not make reality TV popular, and I bet most of you didn't classify these shows as Reality TV. What makes them Reality TV? By definition, Reality TV is a show that documents ostensibly unscripted real-life situations, and often features an otherwise unknown cast. It differs from documentary television in that the focus tends to be on drama and personal conflict, rather than simply educating viewers. So how do you know if what your are watching is Reality TV or another type of show? Documentaries, television news, sports television, talk shows and traditional game shows are not classified as reality television, even though they contain elements of the genre, such as unscripted situations and sometimes unknown participants. Other genres that predate the reality television boom have sometimes been retroactively grouped into Reality TV, including hidden camera shows such as Candid Camera (1948), talent-search shows such as The Original Amateur Hour (1948), documentary series about ordinary people such as the Up Series (1964), high-concept game shows such as The Dating Game (1965), home improvement shows such as This Old House (1979) and court shows featuring real-life cases such as The People's Court (1981). As the popularity of Reality TV increases, more and more people have tried to define sub-genres of Reality TV, but there isn't a general consensus on how many sub-genres there are in Reality TV. So what are these sub-genres? Do you see your favorite show(s) above? So now you know you've been hooked on Reality TV and not even be aware that what you are watching is indeed Reality TV! Find out what classification your favorite TV shows fall into at the links below!